The Wainfleet Wind Energy Project is located in the Township of Wainfleet, Regional Municipality of Niagara in South-Western Ontario. The project study area is located along the North Shore of Lake Erie and wind data has been collected since August 2009. 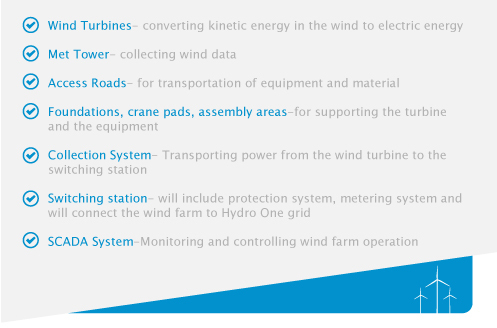 The wind resource was found to be very favourable for the development of a wind farm. The environmental studies were conducted over an area of 3400 hectares and all the project components are located on privately‐ owned agricultural lots within the study area. The topography of the area is open, flat land with an elevation of 174m to 182m. The energy collection system runs underground along the newly constructed access roads as well as public road right of ways. All wind turbines are located on open agricultural fields and will respect all setbacks from residences, natural heritage, water and other features as required under the REA.